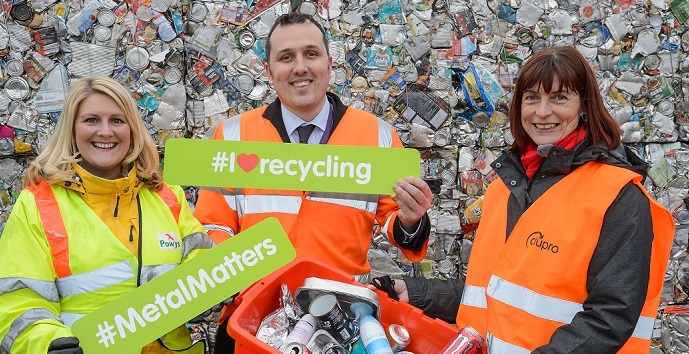 As we celebrate Global Recycling Day, three UK Councils are launching their MetalMatters campaigns. As more and more people across the UK shift their focus towards recycling today, Merthyr Tydfil, Powys and Teignbridge District Council in Devon will urge a total of 157,000 households to ‘Make their metals matter’. Starting today, and for the next 12 weeks, residents will be encouraged to recycle all of their drink cans, food tins, empty aerosols, foil and foil trays in their kerbside recycling bins. Every household will receive leaflets about MetalMatters and the campaign will be supported through local roadshows, outdoor advertising, social media and even a competition to win family tickets to Devon’s top attractions for lucky residents in Teignbridge! Following the ‘Closing the Loop: Four steps towards 100% aluminium packaging recycling’ report published last week by Green Alliance1, these campaigns could not be more timely. The three campaigns are being jointly funded by MetalMatters, an industry partnership comprising of the UK’s leading producers, users and recyclers of metal packaging and Merthyr Tydfil County Borough Council, Powys County Council and Devon County Council respectively. MetalMatters is a shining example of how industry and local authority collaboration can provide a much needed communications boost to improve metal capture rates and reduce contamination. Launched in 2012 the programme has been deployed in 99 local authorities and directly communicated with over 6 million households to date. Pictured: MetalMatters launch with Powys County Council L-R: Nicola Jones, systems and communication manager, Tata Steel; James Thompson, senior waste awareness and enforcement officer, Powys County Council; Kate Cole, programme manager, Alupro.